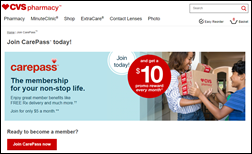 The retail healthcare wars heat up: CVS pilots a delivery service for prescriptions and online purchases at 350 stores in Boston. The CarePass program offers free deliveries with an annual membership fee of $48. It also includes discounts on CVS products, access to a pharmacist helpline, and monthly coupons. The move, which CVS Pharmacy President Kevin Hourican attributes to customer demand, takes Amazon’s Prime membership model one step further by bundling prescriptions with retail goods. Though Amazon acquired prescription delivery service PillPack several months ago, it has yet to offer a similar bundling arrangement. Should the pilot go well, CVS may include MinuteClinic services in an expanded version of the program. Amazon, meanwhile, has launched a line of medical devices called Choice that includes blood pressure cuffs and glucose monitors. The new line was developed with help from consulting firm Arcadia Group, which has developed similar product lines for Walmart. Arcadia hopes to incorporate the devices into Alexa’s repertoire in the coming months. Practice and revenue cycle management company Clinicspectrum relocates to expanded headquarters in Union, NJ. Bloomberg reports that Elliott Management and Veritas Capital have teamed up to bid on Athenahealth. Veritas acquired GE’s revenue-cycle, ambulatory care, and workforce management software business for $1 billion in April. 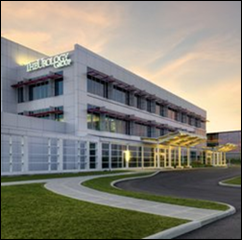 New York-based HIE HealtheLink expands with new office space in Depew. Patient engagement and practice marketing company PatientPop raises new capital, increasing its total funding to $75 million. Less than two months after announcing a $24 million Series A funding round, Cricket Health brings on Sam Mankiewicz (Healthvana) CTO, Robert Sepucha (Fresenius Medical Care) chief administrative officer, and Dianna Budgeon, RN (Sound Physicians) head of clinical operations. 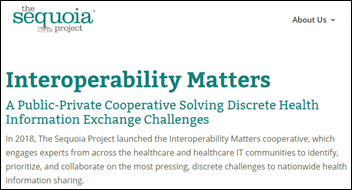 The Michigan Institute of Urology and The Urology Group (OH) go live on Integra Connect’s specialty-focused EHR at a combined 34 locations. 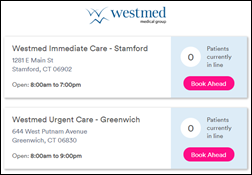 New York-based urgent and primary care provider WestMed Medical Group implements online appointment booking and virtual visit software from Solv Health. 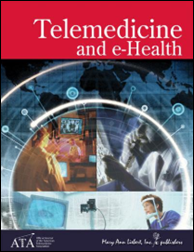 The American Psychiatric Association and American Telemedicine Association publish "Best Practices in Videoconferencing-Based Telemental Health," offering guidance on technology, settings, privacy and security, and clinical considerations for patients of different ages and backgrounds. 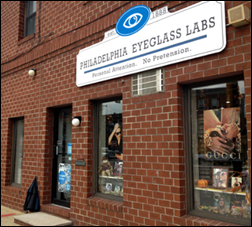 Philadelphia Eyeglass Labs selects 20/20Now’s telemedicine tools for eye care professionals. The five-location practice had been a beta tester of similar technology from DigitalOptometrics. 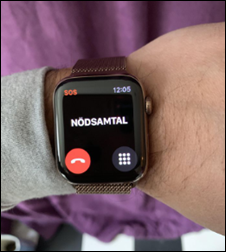 A Swedish man credits his Apple Watch 4’s fall-detection feature with helping him contact emergency services (and quite possibly avoiding a kitchen fire) after suffering crippling back pain that caused him to collapse in the kitchen. The watch sensed the fall and offered to call an ambulance. The fall-alert feature is set to call an ambulance if a user is unresponsive one minute after a fall is detected. Primary care startup Carbon Health merges with Direct Urgent Care. 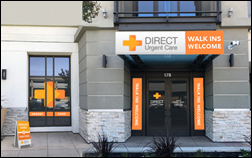 The combined company now offers primary and urgent care at seven clinics in Northern California, aided by the Carbon Health app, virtual consults, and chatbot-powered messaging. 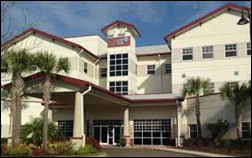 Bonita Springs, FL-based EyeMD EMR Healthcare Systems announces GA of its updated EHR for ophthalmologists. 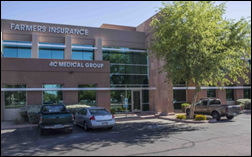 In Arizona, 4C Medical Group will implement Elation’s EHR at its eight clinics. 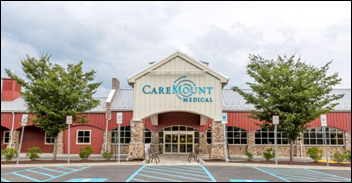 Casamba adds Kno2’s health data exchange capabilities to its EHR for outpatient therapy practices. Casamba end users will now be able to take advantage of Direct messaging, and tap into the networks of CommonWell, Carequality, and a variety of HIEs and ACOs. In Chicago, Plumbers Local Union 130 UA selects Cerner to manage a new clinic for members that will open early next year. Chronic disease management software company Cliexa acquires Preventative Technology Solutions. Cliexa has licensed medical assessment software from PTS for several years as part of its Options behavioral health screening apps for primary care practices. The local business paper looks at Indiana University Health Physician’s efforts to acquire Goodman Campbell Brain and Spine – one of the state’s last independent medical groups. 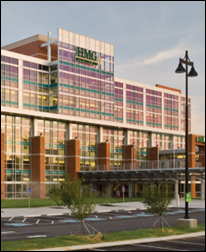 IU Health has acquired 65 physician groups since forming in 2009, but is facing a tough road with Goodman Campbell thanks to a fierce independent streak and in-demand physicians who like having the freedom to practice throughout the area’s health systems. Goodman Campbell Executive Director of Operations John Moeller has let it be known that, “Our goal is to continue to be independent.” Goodman Campbell’s contract with IU Health is up in December 2019. 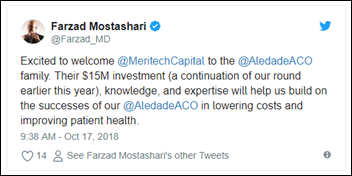 With share prices hovering around $123, CNBC reports that Athenahealth expects to get its highly anticipated deal done with a yet-to-be-named buyer within the next two weeks. The Health Collaborative CEO Craig Brammer will take on the additional role of CEO at The Network for Regional Healthcare Improvement. The Health Collaborative is a member of NRHI, a national nonprofit that works with 30 regional health improvement collaboratives on achieving the Triple Aim. CMS issues a proposed rule that would expand covered telemedicine benefits to Medicare Advantage plans starting in 2020. Genneve will add telemedicine to its line of health and wellness products and services for menopausal women. The Seattle-based startup will offer the virtual consults in five markets this year, and plans to expand in early 2019. Urgent care provider Akos and AdviNow Medical partner to develop a medical station that uses augmented reality to guide patients through the self-collection of diagnostic data, which is then sent to an Akos provider via virtual consult. After the consult, AI-based software takes care of e-prescribing and payment details, and follow up. 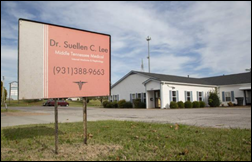 Suellen Lee, MD gives up her medical license after the Tennessee Board of Medical Examiners found she borrowed $300,000 from a patient and co-worker whom she diagnosed with dementia nearly 20 years later. The patient, who was cleared of dementia by another provider, seems to have alerted the board because of Lee’s failure to repay the loan. AdvancedMD will exhibit at the American Academy of Ophthalmology event through October 30 in Chicago. 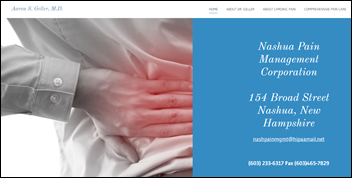 Digital health company Thirty Madison will launch a telemedicine service for migraine sufferers later this year. The New York City-based company announced a $15 million Series A funding round last week, which it will use for the new product launch and to further develop its telemedicine-based prescription service for men’s hair loss. Co-founders Demetri Karagas and Steve Gutentag both hail from Google. 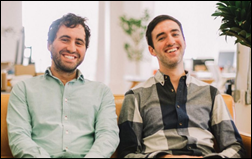 They have raised $23 million since launching the company last year. 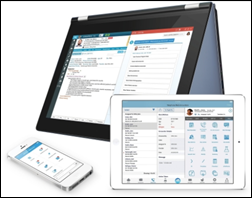 EClinicalworks adds an Opioid Risk Tool to its EHR, giving providers the ability via smart form to assess a patient’s risk for drug abuse and offer alternatives that align with CDC recommendations. New York-based Care Compass Network will use care management technology from GSI Health to integrate the EHRs of its community health partners, and improve care delivered to Medicaid patients within its nine-country service area. Athenahealth incorporates real-time prescription pricing and benefit information from CoverMyMeds with its AthenaClinicals EHR. Medicare quality reporting company Mingle Analytics merges with care management software company SilverVue to form physician practice-focused Mingle Health. Mingle Analytics founder and CEO David Mingle, MD will become executive chairman of the new company. SilverVue founder and CEO Will West will take on the role of CEO. Patrick Block (LeanKit) joins Relatient as CFO. MGMA names Akash Madiah (DaVita Medical Group) CFO. 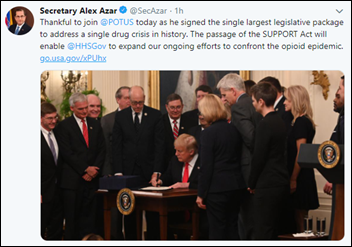 President Trump signs the SUPPORT for Patients and Communities Act into law. The 660-page bill focuses on combatting the opioid epidemic. Among other things, it encourages telemedicine utilization for patients suffering from opioid use disorder, and the adoption of EHRs among behavioral health providers. OCR extends the Mecklenburg Country Health Department in North Carolina an olive branch of sorts by not fining it for a 2017 HIPAA violation. 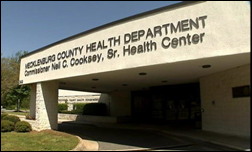 The infraction occurred when the county responded to a local media outlet’s records request with an Excel spreadsheet containing the PHI of thousands of health department patients. The county self-reported the violation, and has agreed to revise its policies, procedures, and training methods; and to purchase hardware and software that will help it better manage records requests. A JAMA study finds that people have crowdfunded over $4 billion sine 2015 to fund unproven medical treatments. The majority of money was raised through GoFundMe for homeopathic or naturopathic cancer treatments. 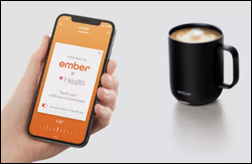 In HIMSS giveaway news: Smart mug manufacturer Ember connects its temperature- and quantity-sensing features with Apple’s Health app, giving users the ability to track their daily caffeine consumption and to better understand how it impacts their heart rate and sleep patterns. The mugs retail for between $80 and $150.